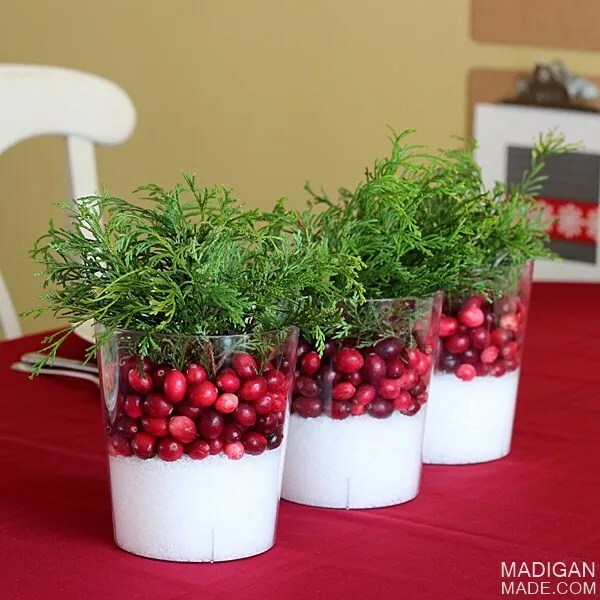 Madigan made… a simple holiday centerpiece with cranberries. I love cranberries. I love to eat them in my yogurt or cereal. I love that they can be both sweet and tart. But most of all, I love their deep red color and sheen, especially this time of year. But today I wanted to show you the centerpieces that I set out when we had family over for Christmas Eve last year. You may recognize the holiday clipboard wall in the background. The arrangements were very simple to create. I grabbed some clear containers from the party supply store (you could use glass vases you had at home, too).Then, I poured Epsom salts in the bottoms of each vase. I added a thick layer of berries on top of the salt. Then, I ran outside with a pair of scissors and trimmed some of our evergreen shrubs. I stuck the greens in the cranberries and that was it! 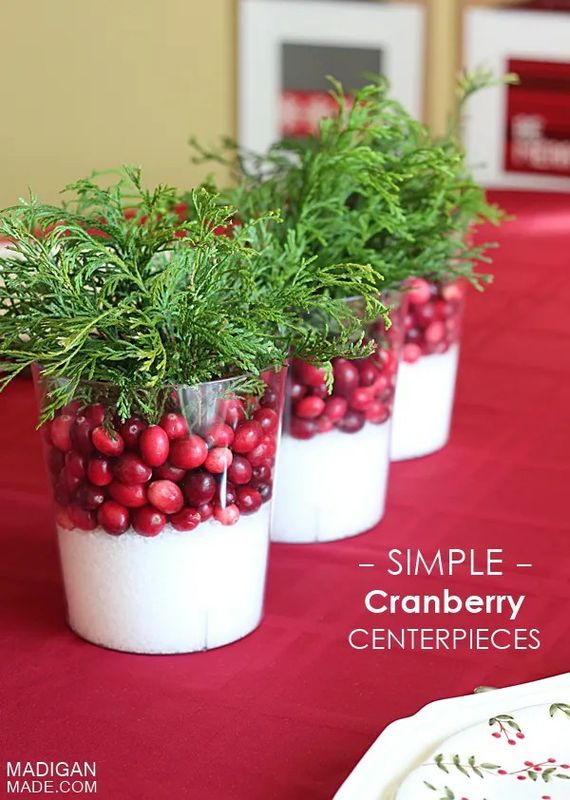 Festive, easy, inexpensive, simple and pretty. Can’t you see why I love cranberries? 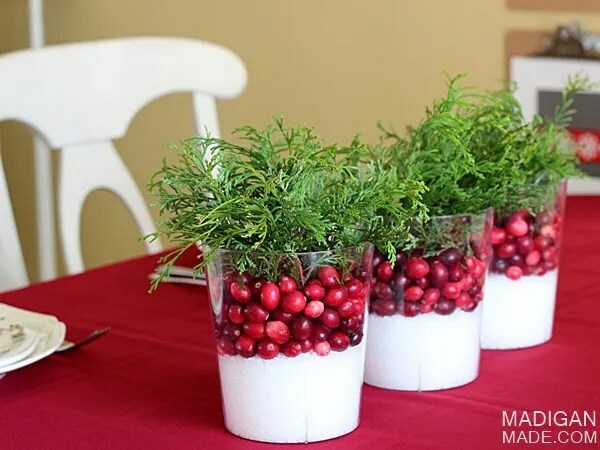 This easy centerpiece idea is very pretty for December, but I think it would be nice to set out for Thanksgiving, too. And if you love cranberries… and holiday entertaining… please be sure to stop back here this Friday! I’m joining up with eleven other bloggers for a virtual progressive dinner! 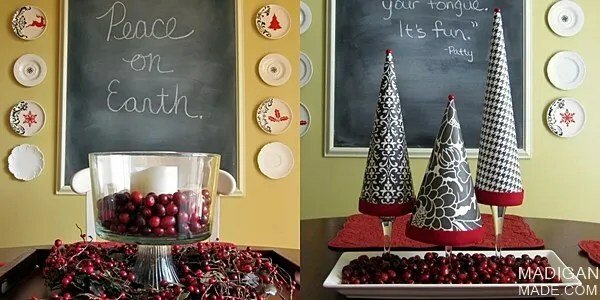 You can get tons of ideas for your next holiday celebration. Between all of us bloggers, you will find two drink recipes, two appetizers, three sides, two main dishes and two dessert ideas. Just click from one blog to the next to follow along! And here’s a hint… my dish contains cranberries! P.S. I will be sharing this project over at the Link Party Palooza and The Party Bunch!